Model Name: Day-Date "Woman in Red"
Literature: The present watch is prominently illustrated in Day-Date, The Presidential Rolex by Pucci Papaleo, page 366 and 367. Ever glamorous, the Day-Date model delights with its myriad of dial, bracelet, bezel and gold-finished designs. Since its inception in 1956, it remains one of the most surprising and diverse flagship models Rolex has ever produced. Apart from prototype models, the Day-Date has only been cased in precious metals, attesting to its glamor and prestige. This superlative Day-Date is fitted with a beautiful red lacquer "Stella" dial and diamond indexes. 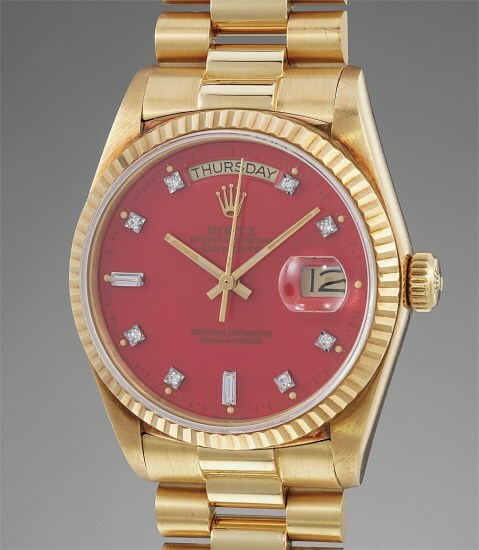 Named "Woman in Red", this timepiece is prominently illustrated in Day-Date, The Presidential Rolex by Pucci Papaleo. Dazzling and incredibly luxurious, it is preserved in excellent and most probably unpolished condition. The case displays an attractive layer of patina throughout and crisp hallmarks beneath the lugs. The bracelet is rigid and preserved in excellent condition. Furthermore, the "Stella" dial is intact and boasts a brilliant red sheen.